$8000 First Time Minneapolis Duplex Buyer Deadline Looms | Your best resource for buying, selling, owning and investing in duplexes and duplex homes. On my way in to the office, I pass several auto dealerships. This morning, I couldn’t help but notice big rows of older cars line up along the back of the lots; the clunkers brought in as the part of the government’s “cash for clunkers” program, which ends tonight. I wondered what the weekend was like for the car dealers; whether they’d had a chance to sleep or eat, and if they had a line of people waiting to talk with them. And when I read Ken Harney’s column in the Washington Post questioning whether Congresss would extend the $8000 first time home buyer tax credit, I imagined a line of buyers at the door of local real estate broker’s offices as the November 30 deadline approaches. There are 14 weeks left. As most real estate transactions take, on average, 45 to 60 days to close (six to eight weeks), there are, for all intents and purposes, just six weeks to go. I realize that sounds like a lot of time. However, anyone who’s been out there looking can tell you, good properties can be hard to find. 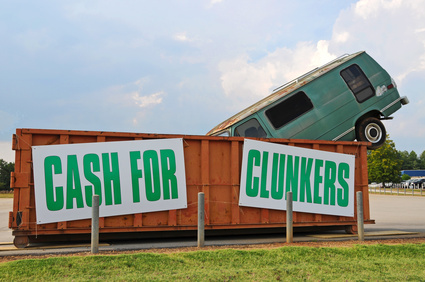 So will Congress extend the deadline like they did with the clunkers program? Hard to tell. They have plenty on their plate already when they return from summer break; including the not-so-small matter of health care reform. According to Harney, there are already bills pending in both the House and Senate to extend the credit for another year. Meanwhile, Senators Christopher Dodd (D-Conn) and Johnny Isakson (R- Georgia) are co-sponsoring a bill that would eliminate the income restrictions on the credit, raise it to a maximum of $15,0000 and extend it to all home buyers. It all sounds exciting. However, it’s important to remember the tax credit ultimately ends up costing the government lost revenue. As the federal budget is already deeply in the red, there may be more than a little resistance. So are they going to extend or expand the credit? Don’t count on it. It is Washington, after all.